(Photo taken by me at the Philips Technology Campus in Eindhoven: it shows the inside of a CD player, blown up to much larger-than-life size as an educational tool). So, the Compact Disc turns 25 this month. For people of a certain age it seems like only yesterday. I was 10 years old, and there was a whole new range of products I never knew could exist but suddenly wanted and couldn't afford. 10 years later I remember the bitter pain I felt when someone stole several of my favorite CDs during a party my little sister threw at our house while I was gone, including my "Jackson 5 Greatest Hits" album, and CD 2 of my "JB (James Brown) and the Horny Horns" featuring Maceo Parker. That one was unreplaceable. Now I have like 300 CDs and never listen to them; too much work to find the ones I want; and "ripping" them all to Mp3 would be more than a week of work (I calculated it). 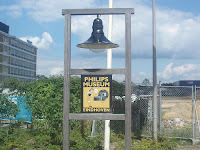 As it happens, I recently had cause to check out Philips' corporate museum in Eindhoven, and I can recommend it to anybody who basically is interested in old technology, antique radios & microphones, that kind of stuff. I think it's a little bit like the Smithsonian used to be. Despite the rather hard-to-fine entrance, and unpromising location near a construction pit, it was full of things like original neon lights that still work, funky old art deco advertisements, televisions ensconced in cabinets made of tropical rain forest wood (in the 1950's when that was not politically incorrect), those weird static bulbs that do something with electricity. Edison records. You get the idea. A mad scientist's laboratory. I have a lot more pictures, I guess I'll add them to my Flickr feed eventually. Oh by the way, as far as the Dutch are concerned, Edison didn't really invent the lightbulb: Philips did. 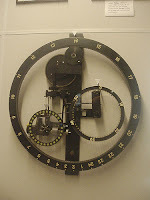 I saw something similar recently about how Alexander Gram Bell didn't invent the telephone. Maybe I should look into this, it could be hot news I suppose.